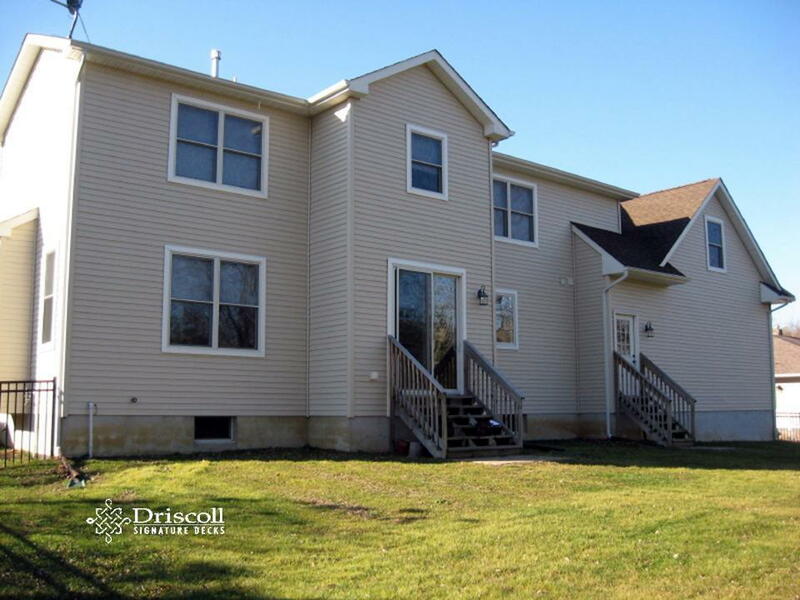 This beautiful new home had a lovely private backyard but, as you can see with not just one, but two builders steps down to nowhere – just waiting for the day Driscoll arrived..! 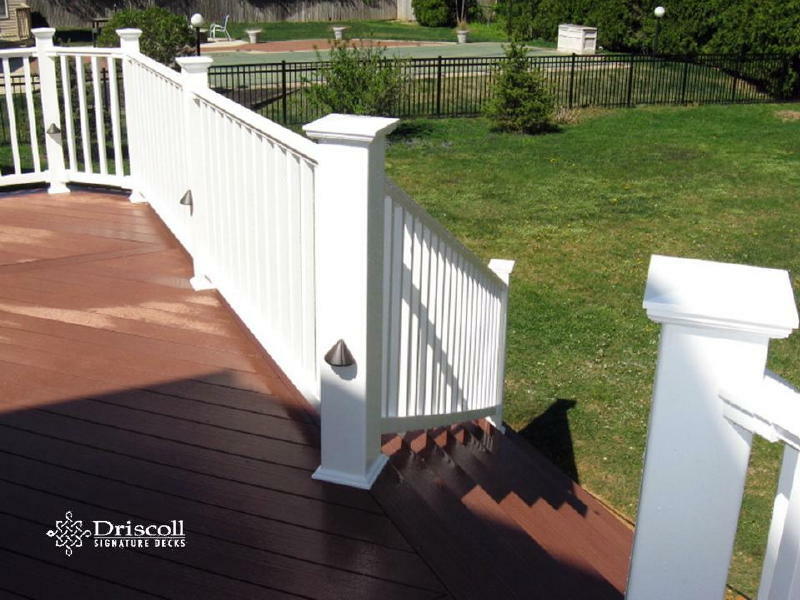 You will find quality deck designs, consultation and excellent craftsmanship when you search for Driscoll Signature Decks at Deck, Decks, Deck Builder, Deck Contractor, Decks NJ, Deck Builder NJ, Deck Contractor NJ, Manasquan Decks, Decks Manasquan NJ, Deck Manasquan, Deck Manasquan NJ Manasquan Decks, Manasquan NJ Decks Manasquan Deck, Manasquan NJ Deck, Deck Contractor, Manasquan, Deck Contractor Manasquan NJ, Manasquan Deck Contractor, Deck Builder Manasquan, Deck Builder Manasquan NJ, Manasquan Deck Builder, Manasquan NJ Deck Builder, Manasquan NJ Deck Contractor. After a few design changes, (on paper of course) and a set of Driscoll ‘Signature’ Flared Stairs added to the final design, that ‘special’ finally day arrived, so we got right to work on building it. 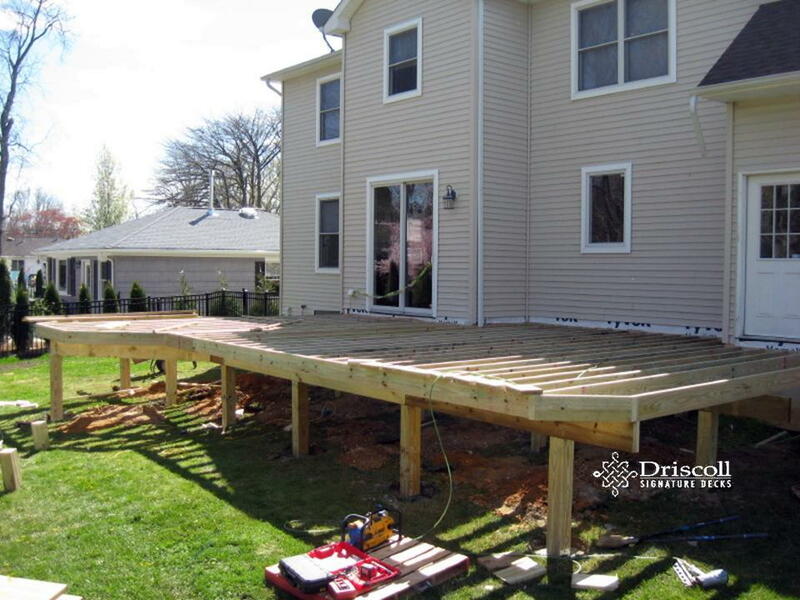 As with all Driscoll Decks, we started with the most important part, our Signature robust framing. 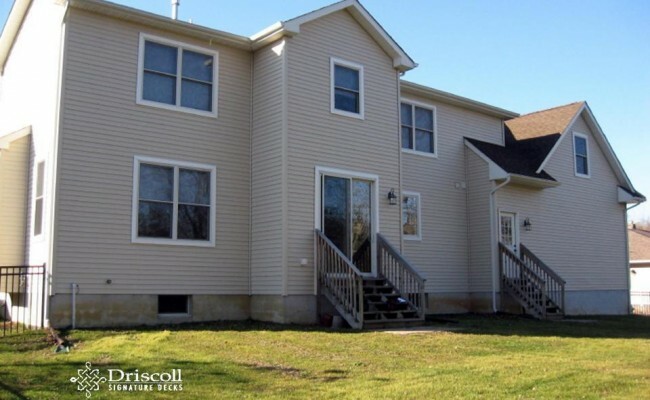 And, for your information (FYI) the IRC building code calls for decks to be built at 45 ppsf, if you take a minute to look at what we call Driscoll Robust Framing we are using 6×6 structural posts at a maximum of 8′oc, with a built-up (double) 2×10 beams (girders) at a maximum 8′ span from the houseline on 2×8 joists at 12″oc which ius rated at 75 ppsf. 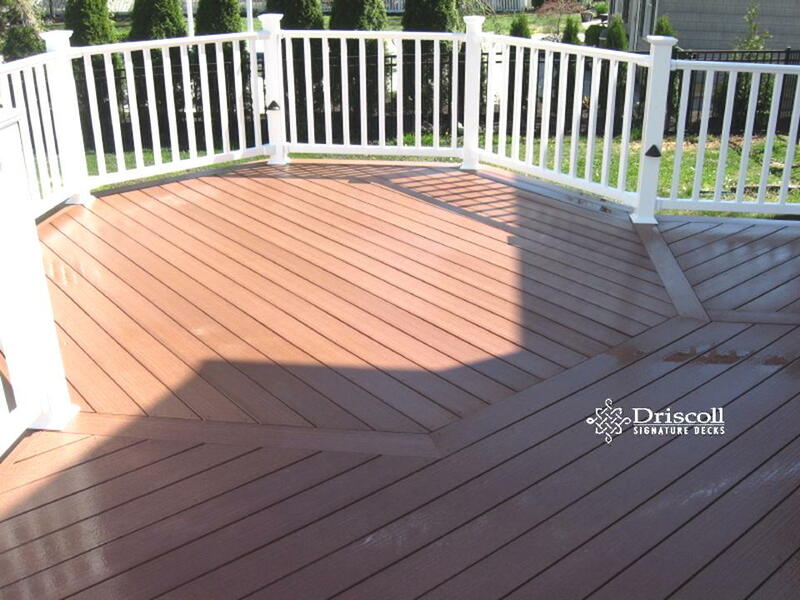 Our finished decks not have to look the best, but must also be the most structually strong. 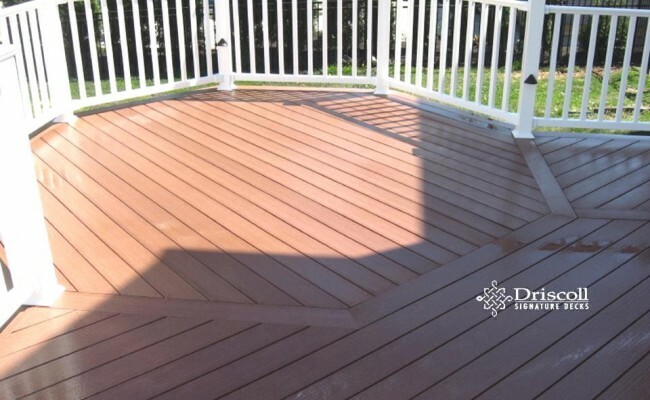 As you can see in the above image, not all our set-off-octagon-dining-areas have to be step-ups, (or level changes), but we still like to set the octagon area off with the octagon-shaped-decking board pattern. 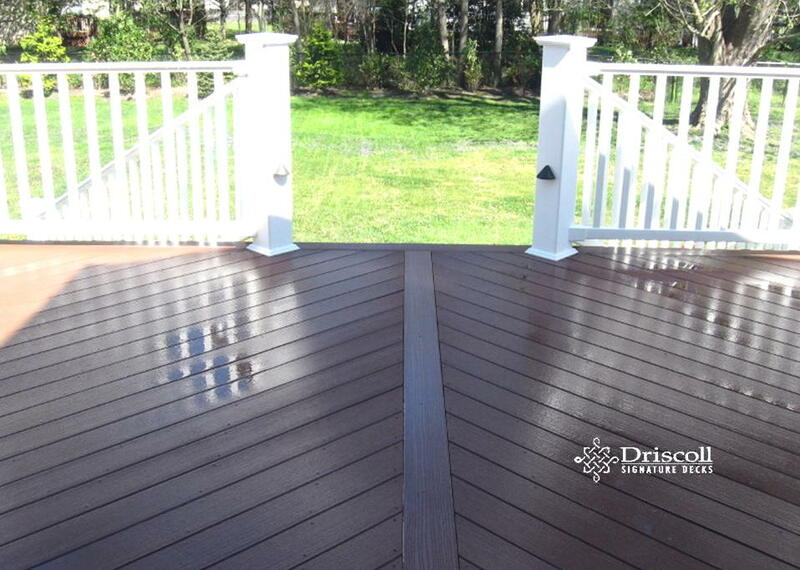 Yes, it is always ‘the little things’ that make all Driscoll ‘Signature’ Decks. 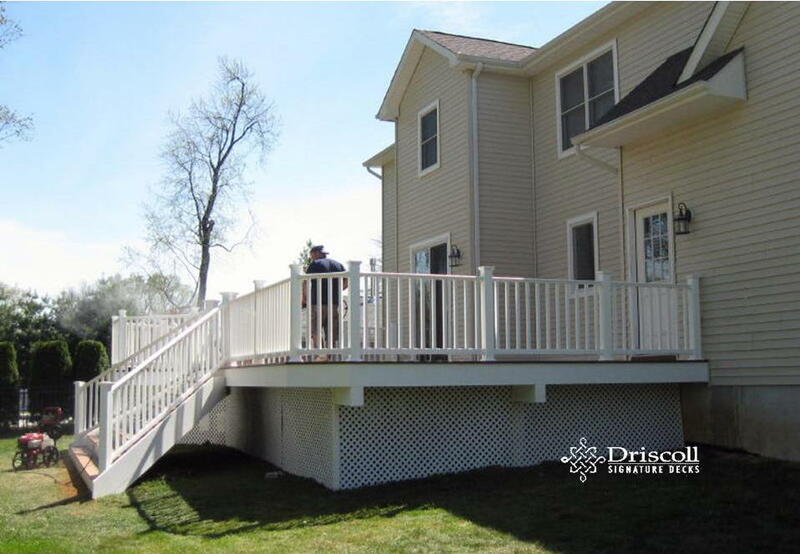 This image show the top of (or on deck side of the flared stairs) Note the 6×6 railing post positioned what we call ‘diamond’ to the houseline (in apposed to be square to the house). 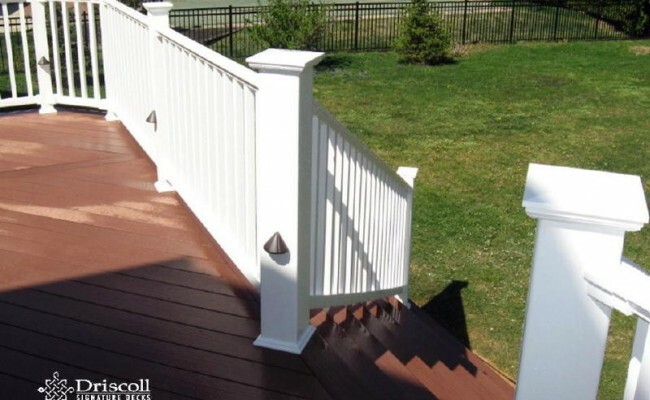 The railing posts were positioned this way for two reasons: 1. ) 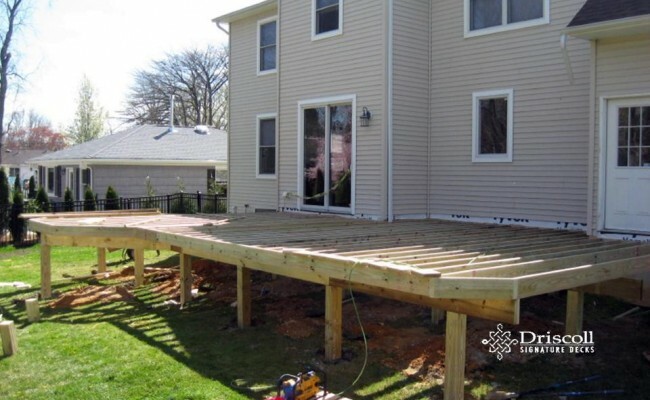 to allow room for both the deck railings and the stair railings to be installed on a flared stair post, and 2.) these flared stairs are at a 45 degree angle to the top railings and so the ‘diamond’ position is in line with the drop of the stair railings – perfect! And, we added a V-angled parting board, right down the middle..! 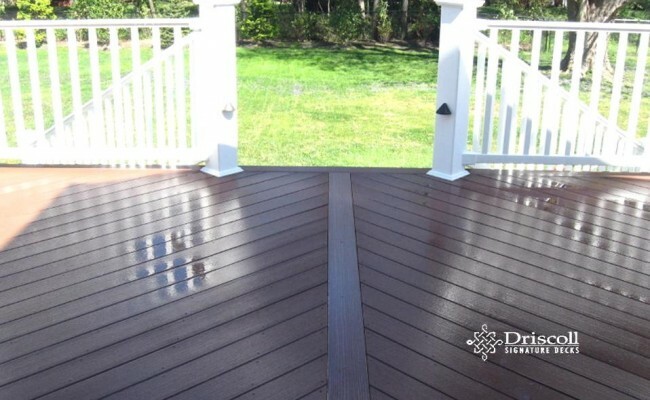 As you can see, these are Classic Driscoll Deck lines and the last thing we do is power-wash so that your Driscoll Deck is not only – new, but also – clean! 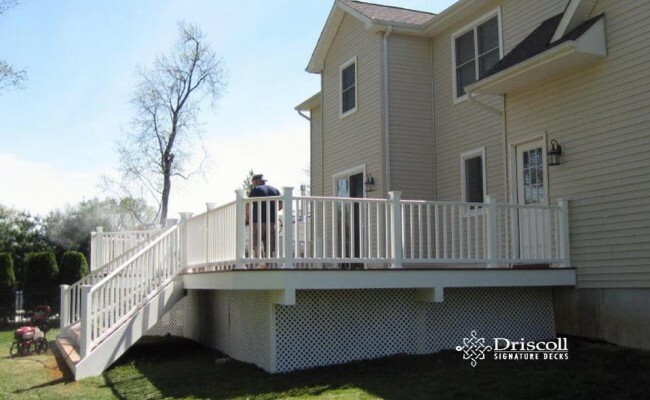 Here is another image of the 45 degree 6×6 posts railing posts for a better visual description of this installation above. 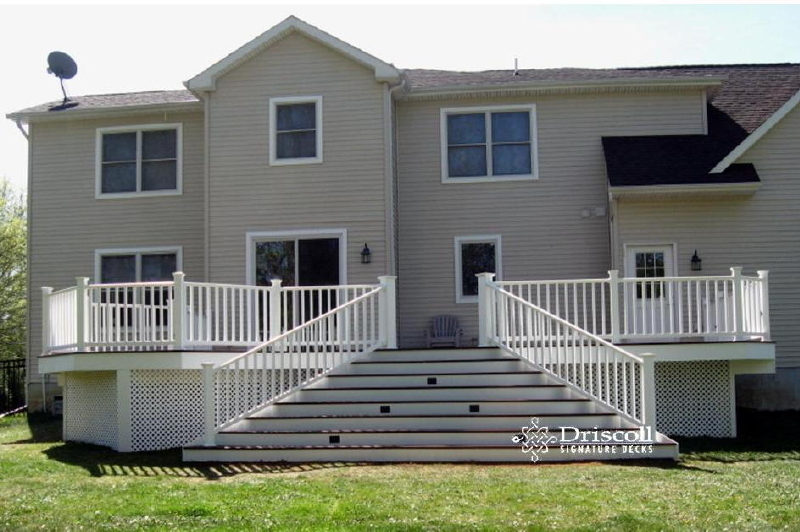 Please note how the deck railing come in from the right side of the picture and then on the left post in the image, you can see how the ‘diamond’ set post is in line with the stair-railing drop..! Don’tcha’ just love it when a great plan comes together.